This article was found in the papers of Mrs. Mary Bowen, widow of General John S. Bowen CSA, who kept all of her husband’s records and newspaper clippings pertaining to the war. Had Mary Bowen not kept this article, the memories of the laying of the cornerstone for the Alabama Confederate Monument might have been lost forever. The 88-foot-tall monument dedicated on December 7, 1898, commemorates the 122,000 Alabamians who fought for the Confederacy during the Civil War. When the good King Cyrus made it possible for the people of Israel to go back home after long captivity there was great rejoicing, and on arrival immediate effort was put forth to get the temple rebuilt. As the time came around to begin work there was jubilation and shouting, but above the noise of the glad throng came the sound of weeping and the cry of many in sorrow. The old men were grieved for the magnificence of the former temple, for the time that once was in the glory of Israel. Today, when the throngs that had gathered from the country around surged up the steps of the Capitol to greet and honor the President of all the people, a good man and a strong man and the shouts of the populace arose in cheers for the head of the nation, many a grizzled countenance wore a look of sorrow and down numberless furrowed cheeks ran the salty tears. They recalled the day when they gathered to welcome the man who had stood at the head of the Confederacy, when after the failure of the Lost Cause had gone by twenty odd years, Jefferson Davis, sick and feeble, left his comfortable Mississippi home to lay the cornerstone of the monument built by the efforts of the good women of the South in memory of the noble men who sacrificed life and fortune on the altar of the Southern Confederacy. These men are patriots of a reunited country and give way to none in reverence for the Union and love for its flag. But they are yet living in love and tender affection for the days when they gave up all to go out to defend the nation they fostered and fought for. It is no sign of loss love for the President of the United States that they wept but for the memory of the days when they willingly gave all for what they thought was best for all the people of all the South. Jefferson Davis came to Montgomery April 28, 1886, for the purpose of laying the cornerstone of the monument to the brave men of the Southern States, at the solicitation of the women of the Memorial Association of the South. He at first refused, believing that it would be too much for his strength, but after a visit from Mayor Warren Reese, he consented to make the trip. He reached here the day before the time set for the opening exercises, April 27, and became a guest of the Exchange Hotel. With him came Gen. John B. Gordon [Georgia] and a number of others to take part and to present at the exercises. Everything had been made ready and there was an immense throng here to welcome the distinguished visitors. The morning of April 28 dawned wet and sloppy. The rain was coming down and conditions were other than propitious for enthusiasm. But there was no lack of it. The people seemed to go wild. A man who remembers it says they cried and shouted until their faces were west with tears and their voices gone. Mrs. John B. Gordon, Miss Fannie Gordon and Miss Winnie Davis, members of the party held receptions at the hotel, but Mr. Davis spent most of his time in the room, seeing but few people. Gen. Gordon, however, mixed with the people and renewed many Civil War life acquaintances. 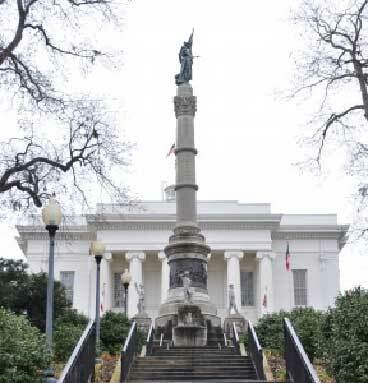 Alabama Confederate Memorial Monument dedicated December 7, 1898, in Montgomery, Alabama. 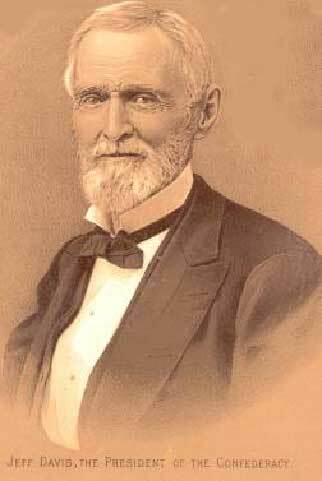 General E. W. Pettus, now United States Senator, was marshal of the day, having come over from Selma to accept the honor. With him rode Hon. Thomas G. Jones, now United States Judge and since then Governor, who was in command of the military forces. Mrs. Davis rode with members of his Cabinet who were here and his daughter. Gen. Gordon was in a carriage with Mayor Reese and Gov. O’Neil. Arriving at the Capitol, Mr. Davis went to the portico on the arm of Mayor Reese and took a seat right over the spot where he stood twenty-five years before to be sworn in as President of the Confederacy. He was introduced by Mayor Reese, who spoke of his feebleness. He [Jefferson Davis] did not talk long. He referred to his taking the oath office just where he stood, and spoke feelingly of the war and the trials sufferings thereof. As he sat down there was roar after roar of applause. All over the vast assemble could be heard sounds of weeping and as Gen. Gordon, who followed him, rose to begin there was not a dry eye in the multitude. Those who heard him say Gen. Gordon made a masterly address. Men cried out in anguish as he pictured scene after scene of the war and brought back so life-like as to almost seem present the deeds and the sufferings of the men of the South. The next day, April 29, was filled with the exercise of laying the corner-stone. President Davis was the chief figure assisted by secret societies and many others of less renown. Today the people received a respected and honored President; then, they were welcoming and honoring a beloved brother and friend, a man who had suffered with and for them, and is it any wonder that there are many eyes wet today and hearts heavy for the memory of the days that are gone, though every man whose lashes glisten with the salt is a loyal and patriotic citizen of the reunited nation? Copyright (c) James and Rebecca Drake, 2014. All Rights Reserved.